Today I'm gonna be a rock star! Mum created the mug below to raise awareness and funds for shelter cats. That is an awesome mug! Great idea and the mug really rocks. I love the mug and you as a rock star. This is such a fun one! Rockstar Athena is looking pretty cool. I could see this picture as a rock album cover, and I would totally buy it. Purrs! You are a fabulous rock star, Athena! That's awesome that your mom is raising money for rescue cats. Devi was a rescue! Athena you are a Goddess with a little rock n roll! Great mug btw! Love the art. Let me know when your first album is out. Cool art! 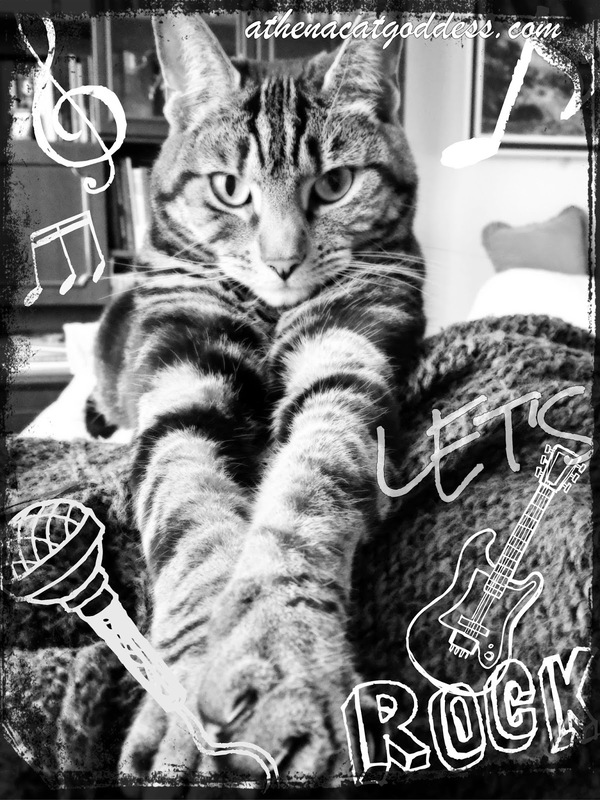 Being a kitty DJ, I love rocknroll! Rescue cats do rock! What a beautiful kitty, I hope your fundraiser goes great. Pawsome message and you are most definitely a rock star, Athena! Athena, you rock all the time!!! Athena! Yous is the Rockingest!! !